This home page design uses a Flash movie controlled from external buttons. 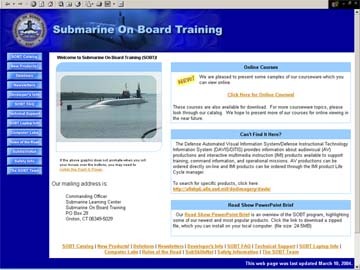 The SOBT home page as it first opens. The title bar text and fly-out description do not appear until the user moves the mouse over one of the buttons. When the mouse is positioned over the top button, the screen looks like this. As the user moves over the button menu, a different photo appears for each button, along with a description of that button. If my qualifications are of interest to you as an employer, please contact me by E-mail. 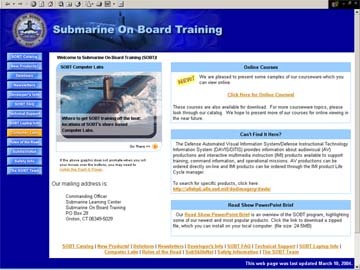 This page was last updated on: April 22, 2004.